Roco is a very lovable character and players will want to get him across the finish line with as many grasses as possible. With only glancing at the game description, it was clear that Mini Roco has the potential to be a very fun game. Once the game was done downloading and opened one is greeted by upbeat music; which was quickly silenced as to not disrupt those around. And the fun begins. Being thrown into the first level is definitely a shocking experience. It is hard to figure out what exactly needs to be achieved. With very vague instructions, it is hard to know how to actually start playing the game. After tapping the screen numerous times with nothing happening the game beings to get frustrating. In which case, the buttons at the bottom left-hand corner of the screen, that at first glance seemed to be unless are what actually gets Roco moving. At this point, the game really starts to get rolling. Once Roco begins to roll and jump it becomes clear that the cow needs to collect the grass, and roll across the finish line to get to the next level. At first, the balloons seem to deter you from your goal, but only a couple levels in and they become useful and help Roco achieve some height on his jumps. 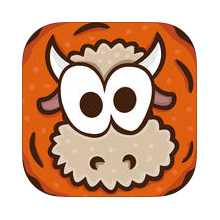 Roco becomes a very adventurous cow with hay bails, lava and other dangerous obstacles to jump over. And let’s not get started on the random bull that just pops up out of nowhere and causes instant death when Roco is bumped into him. Mini Roco starts to become an entraining app. Playing with the settings is definitely a good idea, and should be the first thing that any player does. With tilt mode activated the game gets easier to play, which should definitely be the default for the game. Tilt mood, which allows the player to control Roco with by moving their iPhones/iPads in the desired direction to get him moving, allows Roco to gain speed and be able to soar over obstacles with ease. Although with such speed the inexperienced gamer might miss all the grasses that gain extra points. This mode can also cause many deaths, which if the lives were not unlimited it would be a short-lived game. But thankfully lives in Mini Roco are unlimited, good call developers. Overall, the app is very well animated. Roco is a very lovable character and players will want to get him across the finish line with as many grasses as possible. The app is very user-friendly, although playing on an iPhone is way better then playing on an iPad, especially when tilt mode is activated. There are a few cosmetic changes that could be done to make gameplay more enjoyable. For instance, learning how to move Roco could be better explained, or tilt mode could become the default in which case the instructions are perfect. This is a definite must have for kids that need a distraction or even for ‘on the go’ business man that spends hours at airports and has some downtime. There is never a dull moment when playing Mini Roco.